I attended a mega fab conference last week (UXPA 2015) and literally ran into some awful UX at the hotel. The bathroom entrance on the conference level had a push plate at nearly eye level, and a door handle much lower. On a 2 separate occasions I tried to shove the door open with the push plate and slammed into the door. I cursed the design each time. After it happened the second time, I decided to do a little user research study. Because… well… I couldn’t help myself. 🙂 I sat down across from the door to drink my coffee during a 30 minute break, and watched to count the number of times people crashed into the door thinking it should be pushed. I figured at least one other person would do it. 7 people smashed into the door, full force, in half an hour! One of the 7 even muttered something about how stupid it was to lock a bathroom door in the middle of the afternoon. The door was horribly designed. 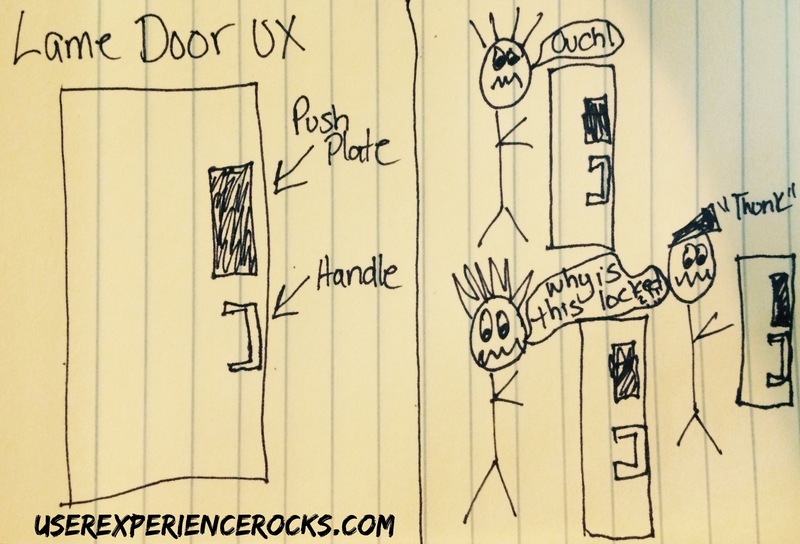 Get it together door makers, and up your game when it comes to UX details!